The Honorable Justice Mary Jane Theis administers the oath of office to The Honorable Sondra Denmark (’04). 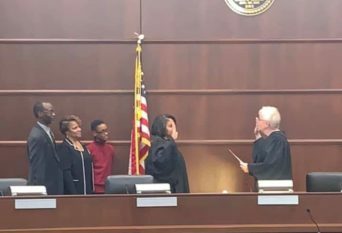 The Honorable Sondra Denmark (’04) was installed as a Cook County Circuit Court Judge in the Second Judicial Subcircuit on December 27, 2018. Prior to her appointment, Judge Denmark served as an Assistant State’s Attorney for 13 years, spending the last 10 years in the Will County State’s Attorney’s Office and three years in the Cook County State’s Attorney’s Office from 2004-2007. She has also worked as a solo practitioner.